BINYAMINA-GIV'AT ADA (IDN) - Around the world, when it comes to nuclear weapons, it is a well know “secret” that Israel is a Nuclear Armed State. Just like India and Pakistan, Israel has developed a nuclear arsenal, but unlike the two, Israel’s arsenal remains a secret. Israel doesn’t talk about its arsenal and usually, doesn’t take part in any international or regional discourse about it. The Israeli ambiguity, or opacity affects mostly the Israeli society. Not just the civil society but also most parliamentarians and even some ministers. As a society, we learned not to talk or even think about the Israeli bomb. Keeping the secret by not thinking about it became some sort of a patriotic act. As a society we keep Israel safe by not thinking of an Israeli nuke, asking about it, or campaigning against it. The words ‘Nuclear Bomb’ are on the news daily, but only in connection with Iran. Maybe, from time to time – North Korea. Under those tough conditions 'The Israeli Disarmament movement' (IDM) is striving to change the attitude of the Israeli society towards nuclear issues and to promote the idea of a global nuclear ban and a Middle East free of weapons of mass destruction. The Israeli Disarmament movement is a grassroots organization that was established in 2007, as a Greenpeace project and was registered as an independent NGO in 2011. The first ever NGO in Israel to deal with disarmament of nuclear or other weapons of mass destruction. In order to reach the media, without which greater exposure is not possible, we hold media events, protests, and more provocative activities such as stripping at a conference in front of President Peres while calling for the Middle East to be stripped of WMD, placing giant notes calling for a world free of nuclear weapons at the Western Wall site (following the religious tradition of inserting notes with prayers or wishes in the wall crevices), or enacting a massive “death scene” in front of the Ministry of Defense calling for “No More Hiroshima” and opposing an attack on Iran. Movement members participate actively in international conferences on nuclear disarmament and the Middle East and, usually in cooperation with other organizations, organize events at the United Nations and during meetings of NPT states parties (review conferences and preparatory committee meetings). 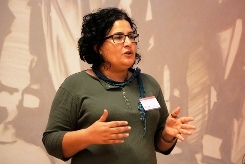 The unique status of the movement – an anti-nuclear movement from the nuclear ambiguous/opaque Israel – has resulted in many opportunities to present our position, to talk about Israel, to recommend new approaches to and perspectives on the nuclear issue in the Middle East, and to meet decision makers and government representatives. We regard these as important opportunities that allow us not only to talk about what we do, but also to learn from campaigns around the world and from leading experts, and even to feel that we have some influence, however small, over the international discourse on this issue. The campaign in Israel is not easy. Fear is the foremost enemy of the anti-nuclear struggle in Israel. At the end of the day, however, the principles of the Israeli campaign are identical to those of campaigns anywhere else in the world: education, dissemination of information, and inspired action. We believe that most residents of Israel, like people everywhere, would prefer a world without nuclear weapons. The Israeli campaign, like others throughout the world, does not exist in a vacuum all by itself. It must be part of a global campaign against nuclear weapons, such as the International Campaign to Abolish Nuclear Weapons (ICAN) – represented in Israel by the Israeli Disarmament movement. Likewise, the Middle East, of which Israel is part, cannot be disconnected from the rest of the world. While we fully support the vision of a Middle East free of WMD, it is important to bear in mind that just as we in Israel analyze developments in Iran with trepidation, Iran watches Pakistan, which views with trepidation developments in India, which analyzes developments in China, which watches the United States, which in turn feels threatened by Russia and Iran. The real challenge and solution, therefore, are to be found in a comprehensive treaty against nuclear weapons, joined by all the states of the world.